Majestic is one of the best-known backlink analysis tools. It is a great source of valuable information not only for link builders. 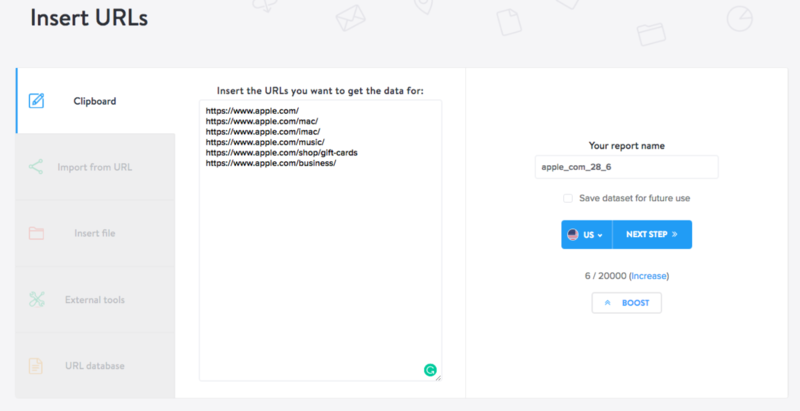 Miner Majestic allows you to get data in bulk for a large volume of URLs or domains directly from the Majestic. This Miner works by linking a user account via OpenApps. To use this Miner, you need to have one of the Majestic subscription plans. There are 3 different subscription plans available. Each of them is limited to different amounts of URL. Lite: 5 000 URLs per month. Pro: 125 000 URLs per month. API: 500 000 URLs per month. Marketing Miner takes these limits into consideration as well. This means that once you have a limit for 5000 URL per month and you will use these URLs in Marketing Miner, you can&apos;t use it in Majestic anymore. 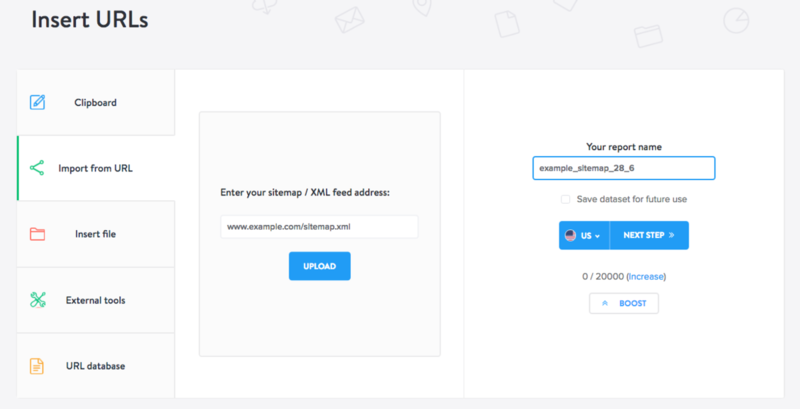 The main advantage of using Miner Majestic over data export directly from Majestic is mostly a combination with other Miners when you choose URL or domain at the input. TIP: Miner Majestic can be combined also with Miner Ahrefs or Open Site Explorer. You can compare each metric conveniently in one output table. Working on link building. If you have a list of websites that you would like to approach, you will first need to evaluate the quality of these sites and prioritize them. Learn more about how to work with the referral portfolio within link prospecting. Analyzing your competitors. If you have a list of competing sites and want to have a quick look at their link portfolio. Analyzing your own website. If you want to find out what kind of content on your site is attracting the links at most. Get started by clicking on Create report button and specifying Domains or URLs at the input. Then write or copy the dataset of the domains or URLs for which you want to get data from Majestic. When you are in the URL report, In the Linkbuilding section, click on Miner Majestic. When you are in the Domain report, In the Website analysis section, click on Miner Majestic. Clicking on Miner will bring up a window with settings. 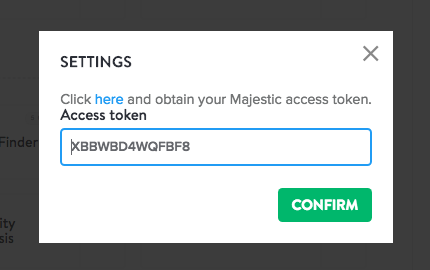 At this point, you have to sign in to your Majestic account and get an access token that you copy into the box below. A link to get access token to Majestic. Click on Confirm and continue by clicking on Get Data to start processing your inputs. ExtBackLinks: The total number of backlinks that link to the specific URL or domain. RefDomains: Total number of referring domains that link to the specific URL or domain. ACRank: Predecessor of Citation flow. RefIPs: Number of IP addresses. CitationFlow: Score with a range between 0-100. It indicates how good and strong links refer to the specific page or domain. The higher the number, the better for you. TrustFlow: Score with a range between 0-100. It indicates how trustworthy is a link portfolio of the specific page or domain. The higher the number, the better for you. TopicalTrustFlow_Topic_0/1/2: Specifies the category of websites that most often refer to the specific URL or domain. Data from Miner Majestic can help you evaluate specific sites and domains you&apos;re considering to approach, or you can evaluate your competitors or content on your site. Focus on the URLs with the highest number of referring domains. This type of pages obviously attracts backlinks the most. Be careful if many links are referring to your site, but from a low number of referring domains. Make sure your link is not located somewhere where it could hurt your page (for example in the footer of the site). If you need to evaluate the quality of the website, you can check out the CitationFlow or TrustFlow. But the high number does not have to mean anything yet. Look also at the site directly and see whether you feel good about it as the user as well. The metrics from these tools are not always 100% reliable and should help you to make a picture about the site. However final evaluation is up to you.